Indonesia contains the largest Muslim population of all countries in the world. The current number of Muslim inhabitants is estimated to be around 207 million individuals, most of whom adhere to Sunni Islam. This large number implies that approximately 13 percent of the total number of Muslims in the world live in Indonesia, thus indicating that Indonesia contains a clear Muslim majority population. But despite this Muslim majority, the country does not constitute a Muslim or Islamic country based on Islamic law. Instead, Indonesia is a secular democratic country with strong Islamic influences. Since the early political debates on the topic of the ideological foundations of the Indonesian nation, certain strict Islamic groups (including some political parties) have spoken out for favouring the establishment of a Muslim country. However, as Indonesia contains dozens of millions of non-Muslims as well as a majority of nominal Muslims, the establishment of an Islamic country (together with implementation of shariah law) has always been regarded as being a trigger for disunity and calls for separatism. Political parties favouring the Islamic nation have never been able to gain the majority of the popular vote throughout the political history of Indonesia. Based on the elections results during the current Reformation period, the stricter Islamic parties are actually losing ground to the secular parties and therefore it seems unlikely that Indonesia will become a Muslim state in the foreseeable future. The process of Islamization in Indonesia (or more precise, in the area we now know as Indonesia) has been underway for many centuries and is still continuing today. Islam became an influential force through a series of waves (international trade, the establishment of various influential Muslim Sultanates, and social movements) that are described in more detail below. However, present Indonesian Islam is also characterized by variety as each region experienced its own unique history, tainted by unique and separate influences. From the later 19th century onwards, Indonesia - as a whole - experienced a more general shared history because colonizers (and continued by the Indonesian nationalists) put a national framework on the various regions. This process of unification has also had its impact on Indonesian Islam which - in a slow pace - is losing its variety. But this should be regarded as a logical development within the process of Islamization in the country. In recent years, media - both national and international - have often reported on attacks on minority religions in Indonesia (such as the Ahmadiyya and Christians). Some radical Muslim groups such as the Front Pembela Islam (Islamic Defenders Front) use violence (or the threat of violence) to achieve their ideals; also against the Muslim community itself, for example by attacking Muslims that sell food at daytime during the holy fasting month Ramadan. It is worrying that the Indonesian government and the Indonesian judiciary do not stand firm against such radical groups, indicating that the government has a weak monopoly on violence. But it should also be stressed, however, that - by far - the majority of the Indonesian Muslim community is highly supportive of a religious pluralist and harmonious society. The populous western part of Indonesia contains a relatively much larger Muslim community than the eastern part. As trade played a significant role in the process of Islamization in Indonesia, islands closer to the main trade routes received more Islamic influences. Western Indonesia, part of a global trade network from the dawn of human history, was much more exposed to such trade-related Islamic influences, hence experiencing the rise and fall of Islamic Sultanates from the 13th century. In particular the Strait of Malacca (between present- day Malaysia and Indonesia) was - and still is - one of the busiest sea-lanes regarding trade. Indonesia is experiencing robust macroeconomic growth: the country's middle class is expanding rapidly as is shown in its steadily rising per capita gross domestic product (meaning people can consume more products and services), and Indonesia's society - as is today's world - is becoming increasingly urbanized (a process that is closely linked to modernization and industrialization). Given that almost 90 percent of Indonesia's total population is Muslim, this community is highly affected by these developments. In the country's bigger cities (in particular on Java, Indonesia's most populous island) this community is showing increasingly consumptive lifestyles. This especially applies to the large moderate Muslim component within this community. They are increasingly living a 'modern' urban lifestyle, equipped with the latest electronic devices and fashion. Important indicators such as car sales and internet or mobile phone penetration have risen fast in recent years, while the young adults of the middle class and elite can frequently be found relaxing in places such as Starbucks in one of the many luxury malls in the bigger cities. Although it is difficult to reconstruct the exact development of early Islamization in the archipelago (due to a lack of sources), it seems certain that international trade played a crucial factor. There probably were foreign Muslim traders in maritime Southeast Asia from early on in the Islamic era. The first sources that inform us about indigenous people adhering to Islam originate from the early 13th century; gravestones indicate the existence of a Muslim kingdom in North Sumatra around 1211. Perhaps indigenous kingdoms adopted the new faith because it entailed certain advantages in trade as the majority of traders were Muslim. It remains unclear, however, why indigenous conversion to Islam seems to have taken place centuries after the region became acquainted with this religion. Only from the 15th century onwards Islamic kingdoms and sultanates became dominant political powers in the archipelago, although these powers were to be undermined by the European newcomers (Portuguese and Dutch) starting from the 16th and 17th century. The arrival of Islam to the archipelago had different impacts on local communities depending on the historical and social context of the area where it arrived. In some parts of the archipelago towns emerged as a result of foreign Muslim traders settling there. In other parts Islam never became the majority-religion, probably due to the distance from the important trade routes (such as eastern Indonesia). In parts where there was a strong presence of animism or Hindu-Buddhist culture, Islam met profound cultural barriers (such as on the island of Bali which is still dominated by Hindu culture today) or it became blended with the pre-existing (animist) belief-systems (examples of which can still be found in Central Java). • Abangan; these are traditional Muslims in the sense that they still apply traditional Javanese dogmatic; blending Islam with Hinduism, Buddhism and animist traditions. Members of this group generally have rural backgrounds. • Santri; these can be labeled as orthodox Muslims. They are mainly from urban backgrounds and are more oriented towards the mosque and the Quran. Geertz actually also recognized a third class, the priyayi (the traditional bureaucracy), but as it constitutes a social class rather than a religious one, it is not included above. The spread of Islam in Indonesia should not be seen as a quick process stemming from one origin or source but rather as multiple waves of Islamization in coherence with international developments in the Islamic world, a process that is still continuing until today (as described above, Muslim traders coming to the archipelago in the first centuries of the Islamic era can be regarded as the first wave). Two important reform waves aiming for the return to the pure Islam - as it was during the days of prophet Mohammed - were the Wahhabist and the Salafi movements. Wahhabism originates from Arabia and arrived in the archipelago early in the 19th century. The Salafi movement came from Egypt at the end of the 19th century. Both these waves had a big impact on the spread of orthodox Islam in the archipelago. Another important development for Islamization in Indonesia was the opening of the Suez-Canal in 1869 because it - as it made traveling to Mecca easier - implied a larger amount of pilgrims between Indonesia and Mecca. This consequently intensified contacts with the religious centers in the Middle East. However, these waves of Islamization have also been cause of tensions and disunity within the Indonesian Islamic community as not everyone agreed with the arrival of an orthodox stream of Islam. For instance, the distinction between modernist (santri) and traditional (abangan) communities on Java are actually the result of the traditionalists' reaction against the reform movement in the 19th century. This division is still visible in the two most influential Islamic organizations in the country today. The Muhammadiyah, a social organization founded in 1912 on Java, represents the modernist Muslim stream that disapproves of the mystical (traditional) Javanese Islam. Currently this organization has around 20 million members. As reaction to the establishment of the Muhammadiyah, traditional Javanese leaders founded the Nahdlatul Ulama (NU) in 1926. Members of the NU are influenced by mystical streams or pre-Islamic elements. Its leadership is also characterized by being more tolerant towards other religions. Its number of members is currently around 35 million. During the last two decades Islam has become more visible on the streets in Indonesia and has begun to play a more important role in the daily affairs of the Muslims. 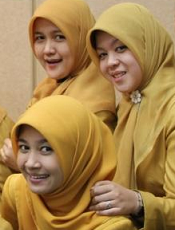 For example, the number of Indonesian women that wear the headscarf (jilbab) has increased significantly, and it has become more common to visit the mosque. However, it is important to underline that this development of Islamization should not be mistaken for Islamic radicalism. By far most Indonesian Muslims are tolerant towards other religions or other streams within the Islam. Only a very small fraction of Indonesian society agrees with and/or participates in radical or terrorist activities. Although Muslim radicalism in Indonesia has been given much attention since the 9/11 attacks in New York (particularly after the Bali and Jakarta bombings in the 2000s), it is not a new phenomenon to the country. Incidences which involved Islamic radicalism have been witnessed before, such as the Darul Islam rebellions in the 1950s, regional rebellions in the late 1950s, the massacres of communists in 1965-1966, an airplane hijacking in 1981, multiple attacks on Christian churches and Buddhist monuments, as well as multiple actions against brothels, bars and casino's in recent decades. For more detailed information regarding this topic please visit our Radical Islam page.